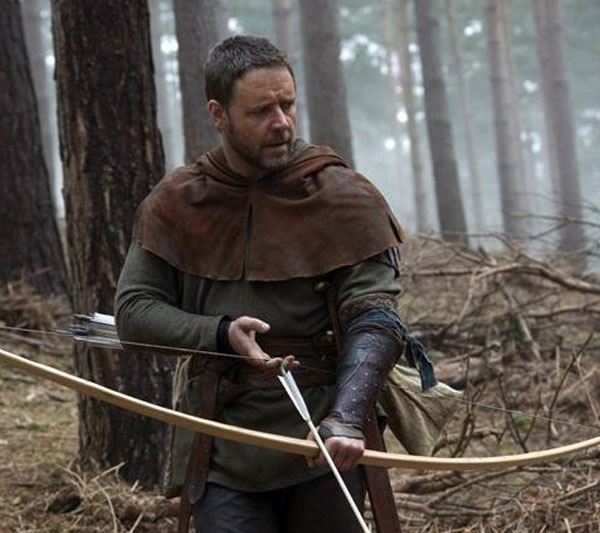 Since I’m a sap for anything medieval, I knew I would probably enjoy Ridley Scott’s, Robin Hood, even if his movies are generally too violent for my taste. I have to say that I liked the movie more than I thought I would. He refrained from his usual slo-mo blood spray as the hero kills another man (or dies himself), for which I was grateful. In summary, the movie follows Robin from France, where he was in King Richard’s army on the way home from the Holy Land, to England, where he falls into an impersonation of the dead heir to the Locksley lands. To be fair, Robin did impersonate the poor dead Sir Locksley initially, but he approached the dead man’s family on the up-and-up. Meanwhile, John, now King John as Richard died in a final siege in France on his way home from the Crusades, has put his trust in the wrong man. This Englishman, Godfrey, was a nursling with John, and thus is trusted by him above all others. King John strips William Marshal of his station and gives it to Godfrey. Unfortunately, Godfrey is secretly in league with the King of France and decides he must hunt Robin down since Robin knows of this alliance. Naturally, Robin evades him and proceeds to rally the unhappy northern English lords against John, who has put Godfrey in charge of collecting taxes. But unbeknownst to John, Godfrey is killing English people and besieging towns, all to foment unrest and open the way for the King of France to attack a divided England. Clever, actually. Ultimately, the barons force King John to promise to sign the Magna Carta (15 years early) and the King of France is defeated at the sea, along with Godfrey, whom Robin kills. Robin is one of the leaders in the battle (having earned Willliam Marshal’s respect, natch). But somehow (and this is never explained) King John discovers that Robin is a fraud and in a fit of anger not only refuses to sign the Magna Carta but outlaws Robin. No idea how that happened. Also, Robin’s father was somehow the architect of the Magna Carta and best buds with William Marshal. And was killed for it when Robin was a boy. Although the plot is full of holes and historical inaccuracies, I liked the character development, I liked Russell Crowe in this role, and I thought Cate Blanchette made an interesting 40-something Marian. Nitpicking, the color of her hair was odd and she wore it down all the time, but she was appropriately sharp-witted. Virtually all the characters and situations, barring King John himself and William Marshall, one of the greatest knights of his age, are fabrications, including the evil Godfrey. Louis, the Prince of France, not the King of France, did plan to invade England at one point–was invited in, in fact, by the rebel barons–but not until 1215. From Wikipedia: “At first, in November 1215, Louis simply sent the barons a contingent of knights to protect London. However, even at that stage he also agreed to an open invasion, despite discouragement from his father the King of France and from the Pope. This came in May 1216 – watchmen on the coast of Thanet detected sails on the horizon, and on the next day, the King of England and his armies saw Louis’s troops disembark on the coast of Kent. John decided to escape to the Saxon capital of Winchester, and so Louis had little resistance on his march to London. He entered London, also with little resistance, and was openly received by the rebel barons and citizens of London and proclaimed (though not crowned) king at the cathedral. Many nobles, including Alexander II of Scotland for his English possessions, gathered to give homage to him. John died in October of 1216, however, and the barons immediately decided they’d rather be ruled by his son, Henry III (then only 9) with William Marshal as regent. By September of 1217, all of Louis’ English barons had defected back to Henry and he sailed back to France. None of this is in the movie, of course. I had hoped that certain aspects of the plot would make more sense when watched a second time. To a certain degree they did, because I watched the Director’s Cut (I always recommend Ridley Scott’s Director’s cuts–he puts way to much into his movies, and then cuts them, leaving key plot points on the floor). I enjoyed this movie. ← Previous Previous post: What is Mead? Checking my rss feeds, I found and greatly enjoyed your review – with Robin Hood (2010) playing in the background!